The term "multiple births" refers to the delivery of twins and higher-order multiples (ie, triplets, quadruplets, etc). Multiple births occur when multiple fetuses are carried during a pregnancy with the subsequent delivery of multiple neonates. Pregnancies complicated by multiple births are associated with a higher rate of neonatal morbidity and mortality, paralleling the increased risk of preterm delivery, low birth weight, and other associated high-risk morbidities. Maternal morbidity and mortality are also increased in pregnancies complicated by multiple gestations and multiple births. The incidence of monozygotic twins is constant worldwide, approximately four per 1000 births. The incidence of multiple zygotic pregnancies varies in relation to maternal age, the use of assisted reproductive technology (ART), and ethnicity. 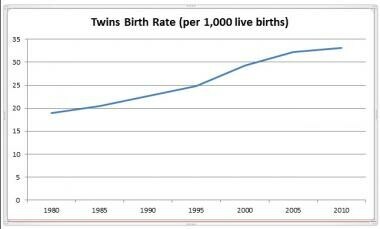 As previously stated, the incidence of monozygotic twins is constant worldwide (approximately 4 per 1000 births). Approximately two thirds of twins are dizygotic. Birthrates of dizygotic twins vary by race (10-40 per 1000 births in blacks, 7-10 per 1000 births in whites, and approximately 3 per 1000 births in Asians) and maternal age (ie, the frequency has risen with increasing maternal age ≤40 years). Dizygotic-twin birthrates are also influenced by other factors, such as parity and mode of fertilization (ie, most artificially conceived twins are dizygotic; however, 6-10% are monozygotic). 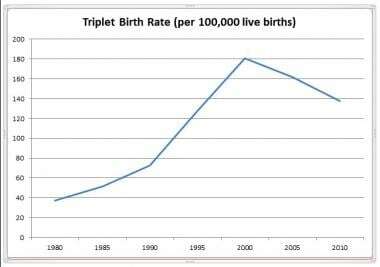 Naturally occurring triplet births occur in approximately 1 per 7000-10,000 births; naturally occurring quadruplet births occur in approximately 1 per 600,000 births. National Vital Statistics Reports, August 2012. Courtesy of the US Department of Health and Human Services (HHS). Birthrates of dizygotic twins vary by race. The highest birthrate of dizygotic twins occurs in African nations, and the lowest occurs in Asia. The Yorubas of southwestern Nigeria have a birthrate of 45 twins per 1000 live births, with approximately 90% being dizygotic. The increase in fetal and neonatal morbidity and mortality associated with multiple- gestation/birth pregnancies correlates with an increased risk of preterm delivery, low birth weight, and intrauterine growth retardation. Ie, the neonatal mortality rate in multiple-fetus pregnancies is similar to singleton rates, increasing with decreasing gestational age. Preterm by plurality, United States, 2011. Courtesy of March of Dimes (www.marchofdimes.org). Birth weight is closely associated with gestational age, so the increased incidence of preterm delivery influences the rate of reduced birth weights in multiple-birth neonates. These neonates also have an increased incidence of intrauterine growth retardation. Divergence from singleton growth curves occurs at approximately 32-33 weeks in twin gestations, at 29-30 weeks in triplet gestations, and at 27-28 weeks in quadruplet gestations. Comparing specific morbidities and mortality in multiple-gestation pregnancies is difficult due to the complexity of contributing factors. For example, some evidence suggests a link between ART and perinatal morbidity unrelated to the risks associated with multiple births. As previously reviewed, chorionic-amniotic placentation also affects multiple-gestation outcomes. In a prospective cohort study of monochorionic twins followed from the first trimester to a mean age of 24 months, Ortibus et al found that twin-to-twin transfusion syndrome (a specific morbidity in multiple-gestation pregnancies) and assisted conception increased the risk of both death and neurodevelopmental impairment, whereas early onset discordant growth increased only the risk of death. Of the 136 pregnancies studied, 90% resulted in both twins surviving, 4% resulted in one survivor, and 6% resulted in no survivors. Overall mortality was 8%, and neurodevelopmental impairment occurred in 10% of infants. Determination of placental chorionicity can be evaluated by obstetric ultrasonography during the first and early second trimester. Evaluation of the placenta(s) after birth may also be helpful in the perinatal evaluation process. Monozygotic pregnancies involve the fertilization of a single ovum by a single sperm. Monozygotic twins develop when a single fertilized ovum splits after conception. An early splitting of the ovum (ie, within 2 days of fertilization) produces separate chorions and amnions. These dichorionic twins have different placentas, which can be separate or fused. Approximately 30% of monozygotic twins have dichorionic/diamniotic placentas. Later splitting (ie, 3-8 days after fertilization) results in monochorionic/diamniotic placentation (see the image below). 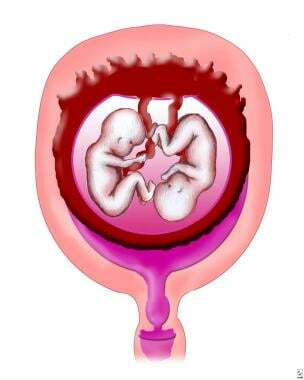 Approximately 70% of monozygotic twins are monochorionic/diamniotic. If splitting occurs later (ie, 9-12 days after fertilization), monochorionic/monoamniotic placentation occurs (see the image below). 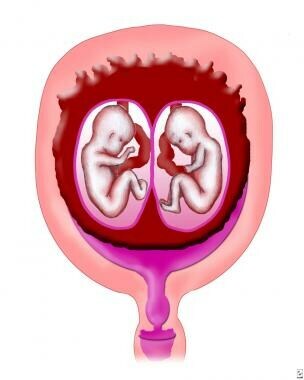 Monochorionic/monoamniotic twins are rare; only 1% of monozygotic twins have this form of placentation. 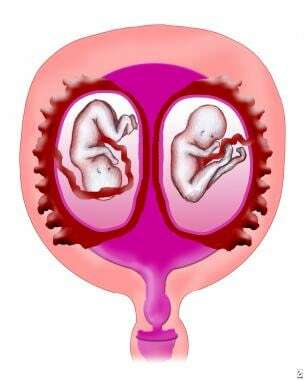 Monochorionic/monoamniotic twins have a common placenta, with the possibility of significant vascular communication between the 2 fetal circulations. These twins can develop twin-to-twin transfusion syndrome. If twinning occurs more than 12 days after fertilization, then the monozygotic fertilized ovum only partially splits, resulting in conjoined twins. Dizygotic, trizygotic, and other higher-order pregnancies involve the fertilization of multiple ova. Dizygotic twins, for example, develop when two ova are fertilized. Dizygotic twins have separate amnions, chorions, and placentas (see the image below). The placentas in dizygotic twins may fuse if the implantation sites are proximate. The fused placentas can be easily separated after birth. Triplet pregnancies result from various fertilization, splitting, and development scenarios that involve ova and sperm. For example, triplets can be monozygotic, dizygotic, or trizygotic. Trizygotic triplets occur when three sperm fertilize three ova. Dizygotic triplets develop from one set of monozygotic cotriplets and a third cotriplet derived from a different zygote. Finally, two consecutive zygotic splittings with a vanished fetus can also result in monozygotic triplets. Zygosity in quadruplets and higher order multiples also varies. Blickstein I, Shinwell ES. Obstetric Management of Multiple Gestation and Birth. Martin RJ, Fanaroff AA, Walsh MC, eds. Fanaroff and Martin's Neonatal-Perinatal Medicine: Diseases of the Fetus and Infant. 9th ed. Philadelphia, Pa: Saunders/Elsevier; 2011. Chapter 19. ACOG Practice Bulletin No. 144: Multifetal gestations: twin, triplet, and higher-order multifetal pregnancies. Obstet Gynecol. 2014 May. 123(5):1118-32. [Medline]. Chauhan SP, Scardo JA, Hayes E, Abuhamad AZ, Berghella V. Twins: prevalence, problems, and preterm births. Am J Obstet Gynecol. 2010 Oct. 203(4):305-15. [Medline]. Qiu X, Lee SK, Tan K, Piedboeuf B, Canning R. Comparison of singleton and multiple-birth outcomes of infants born at or before 32 weeks of gestation. Obstet Gynecol. 2008 Feb. 111(2 pt 1):365-71. [Medline]. Ananth CV, Chauhan SP. Epidemiology of twinning in developed countries. Semin Perinatol. 2012 Jun. 36(3):156-61. [Medline]. Lee YM, Cleary-Goldman J, D'Alton ME. The impact of multiple gestations on late preterm (near-term) births. Clin Perinatol. 2006 Dec. 33(4):777-92; abstract viii. [Medline]. Wright VC, Chang J, Jeng G, Macaluso M. Assisted reproductive technology surveillance--United States, 2005. MMWR Surveill Summ. 2008 Jun 20. 57(5):1-23. [Medline]. Martin JA, Hamilton BE, Ventura SJ, Osterman MJ, Wilson EC, Mathews TJ. Births: final data for 2010. Natl Vital Stat Rep. 2012 Aug 28. 61(1):1-72. [Medline]. Fanaroff AA, Martin RJ. Obstetrical management of multiple gestation. Fanaroff and Martin. Neonatal-Perinatal Medicine: Diseases of the Fetus and Infant. 7th ed. St. Louis, MO: Mosby; 2002. Vol 2: 325-9. Norwitz ER, Edusa V, Park JS. Maternal physiology and complications of multiple pregnancy. Semin Perinatol. 2005 Oct. 29(5):338-48. [Medline]. March of Dimes Perinatal Data Center. Peristats. March of Dimes. Available at https://www.marchofdimes.org/Peristats/ViewTopic.aspx?reg=99&top=3&lev=0&slev=1. Accessed: Jan 12 2015. ACOG. Perinatal Risks Associated With Assisted Reproductive Technology. Nov 2005. Available at http://www.acog.org/-/media/Committee-Opinions/Committee-on-Obstetric-Practice/co324.pdf?dmc=1&ts=20141213T1633045253. Shinwell ES. Neonatal morbidity of very low birth weight infants from multiple pregnancies. Obstet Gynecol Clin North Am. 2005 Mar. 32(1):29-38, viii. [Medline]. Garite TJ, Clark RH, Elliott JP, Thorp JA. Twins and triplets: the effect of plurality and growth on neonatal outcome compared with singleton infants. Am J Obstet Gynecol. 2004 Sep. 191(3):700-7. [Medline]. Bryan E. The impact of multiple preterm births on the family. BJOG. 2003 Apr. 110 Suppl 20:24-8. [Medline]. Refuerzo JS. Impact of multiple births on late and moderate prematurity. Semin Fetal Neonatal Med. 2012 Feb 23. [Medline]. Dias T, Patel D, Thilaganathan B. Prospective risk of late stillbirth in monochorionic twins: a regional cohort study. Ultrasound Obstet Gynecol. 2012 Feb 3. [Medline]. ACOG Practice Bulletin #56: Multiple gestation: complicated twin, triplet, and high-order multifetal pregnancy. Obstet Gynecol. 2004 Oct. 104(4):869-83. [Medline]. Placental Function and Diseases; Multiple Births. Avery's Diseases of the Newborn. 8th ed. 23-31, 57-62. Beischer NA, Mackay EV, Colditz PB. Multiple pregnancy. Obstetrics and the Newborn: An Illustrated Textbook. 3rd ed. London, England: Bailliere Tindall; 1997. 258-73. Blickstein I. Do multiple gestations raise the risk of cerebral palsy?. Clin Perinatol. 2004 Sep. 31(3):395-408. [Medline]. Donovan EF, Ehrenkranz RA, Shankaran S, Stevenson DK, Wright LL, Younes N. Outcomes of very low birth weight twins cared for in the National Institute of Child Health and Human Development Neonatal Research Network's intensive care units. Am J Obstet Gynecol. 1998 Sep. 179(3 Pt 1):742-9. [Medline]. Henderson J, Hockley C, Petrou S, et al. Economic implications of multiple births: inpatient hospital costs in the first 5 years of life. Arch Dis Child Fetal Neonatal Ed. 2004 Nov. 89(6):F542-5. [Medline]. Hibbs AM, Black D, Palermo L, Cnaan A, Luan X, Truog WE, et al. Accounting for multiple births in neonatal and perinatal trials: systematic review and case study. J Pediatr. 2010 Feb. 156(2):202-8. [Medline]. [Full Text]. Lambalk CB, van Hooff M. Natural versus induced twinning and pregnancy outcome: a Dutch nationwide survey of primiparous dizygotic twin deliveries. Fertil Steril. 2001 Apr. 75(4):731-6. [Medline]. Malone FD, D'Alton ME. Anomalies peculiar to multiple gestations. Clin Perinatol. 2000 Dec. 27(4):1033-46, x. [Medline]. Nielsen HC, Harvey-Wilkes K, MacKinnon B, Hung S. Neonatal outcome of very premature infants from multiple and singleton gestations. Am J Obstet Gynecol. 1997 Sep. 177(3):653-9. [Medline]. Ortibus E, Lopriore E, Deprest J, et al. The pregnancy and long-term neurodevelopmental outcome of monochorionic diamniotic twin gestations: a multicenter prospective cohort study from the first trimester onward. Am J Obstet Gynecol. 2009 May. 200(5):494.e1-8. [Medline]. Pharoah PO. Cerebral palsy in the surviving twin associated with infant death of the co-twin. Arch Dis Child Fetal Neonatal Ed. 2001 Mar. 84(2):F111-6. [Medline]. [Full Text]. Salihu HM, Kinniburgh BA, Aliyu MH, et al. 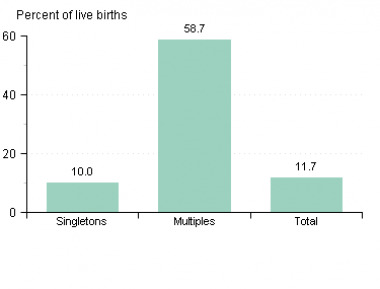 Racial disparity in stillbirth among singleton, twin, and triplet gestations in the United States. Obstet Gynecol. 2004 Oct. 104(4):734-40. [Medline]. Shinwell ES. Neonatal and long-term outcomes of very low birth weight infants from single and multiple pregnancies. Semin Neonatol. 2002 Jun. 7(3):203-9. [Medline]. Shinwell ES, Blickstein I. The risks for very low birth weight infants from multiple pregnancies. Clin Perinatol. 2007 Dec. 34(4):587-97, vi-vii. [Medline]. Smith-Levitin M, Skupski DW, Chervenak FA. Multifetal pregnancies: epidemiology, clinical characteristics, and management. Reece EA, Hobbins JC, eds. Medicine of the Fetus and Mother. Philadelphia, Pa: Lippincott-Raven; 1999. 243-65. Spellacy WM. Multiple pregnancies. Scott JR, DiSaia PJ, Hammond CB, et al eds. Danforth's Obstetrics and Gynecology. Philadelphia, Pa: Lippincott-Raven; 1999. 293-300. Tough SC, Greene CA, Svenson LW, Belik J. Effects of in vitro fertilization on low birth weight, preterm delivery, and multiple birth. J Pediatr. 2000 May. 136(5):618-22. [Medline]. Udom-Rice I, Inglis SR, Skupski D, et al. Optimal gestational age for twin delivery. J Perinatol. 2000 Jun. 20(4):231-4. [Medline]. Wen SW, Fung KF, Oppenheimer L, et al. Neonatal mortality in second twin according to cause of death, gestational age, and mode of delivery. Am J Obstet Gynecol. 2004 Sep. 191(3):778-83. [Medline]. Wenstrom KD, Gall SA. Incidence, morbidity and mortality, and diagnosis of twin gestations. Clin Perinatol. 1988 Mar. 15(1):1-11. [Medline]. Wright VC, Chang J, Jeng G, Chen M, Macaluso M. Assisted reproductive technology surveillance - United States, 2004. MMWR Surveill Summ. 2007 Jun 8. 56(6):1-22. [Medline]. Zhang J, Hamilton B, Martin J. Delayed interval delivery and infant survival: a population-based study. Am J Obstet Gynecol. 2004 Aug. 191(2):470-6. [Medline].